This image of the Rosette Nebula was created using data taken through the INT Photometric H-Alpha Survey of the Northern Galactic Plane. A new simulation explains the hole at the center of the Rosette Nebula that gives the cloud of interstellar gas and dust its distinctive rose-like shape. The Rosette Nebula sits in the Milky Way about 5,000 light-years from Earth. 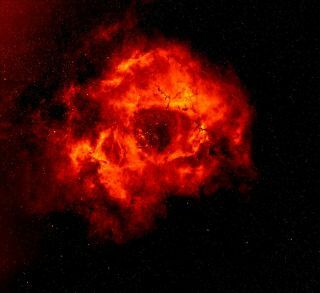 Massive stars at its core have blasted a hole in the cloud of material with radiation and flows of charged gas particles, called stellar wind. But the size of the hole didn't match up with the age of the central stars; simulations suggested that an even larger hole should have bloomed in the material. "The massive stars that make up the Rosette Nebula's central cluster are a few millions of years old and halfway through their lifecycle," Christopher Wareing, a researcher at the University of Leeds in England and the lead author of the new work, said in a statement. "For the length of time their stellar winds would have been flowing, you would expect a central cavity up to ten times bigger." At left, you can see the simulated Rosette Nebula, with its central hole created by massive stars' activity at its core. At right, a slice through the nebula's simulation shows the disc of the cloud of material (vertical, in red) blowing gas and dust from a central star (blue) out and away from the cloud. To investigate the discrepancy, Wareing's group simulated the stars' actions at the heart of molecular clouds with different shapes, including "a clumpy sphere, a thick filamentary disc and a thin disc, all created from the same low-density initial atomic cloud," Wareing said. "It was the thin disc that reproduced the physical appearance — cavity size, shape and magnetic-field alignment — of the nebula, at an age compatible with the central stars and their wind strengths," he said. The researchers used data from the European Space Agency's Gaia spacecraft, which is currently building a 3D model of the Milky Way, to incorporate the exact locations of several bright stars within the nebula. "To have a model that so accurately reproduces the physical appearance in line with the observational data, without setting out to do this, is rather extraordinary," Wareing said. "Next we'll look at the many other similar objects in our galaxy and see if we can figure out their shape as well." The new work was detailed Feb. 13 in the journal Monthly Notices of the Royal Astronomical Society.